It has often been said that the eyes are the windows to the soul. They can tell you a lot about someone. Conversely, the eyes you are drawn to may indicate a great deal about your own personality. 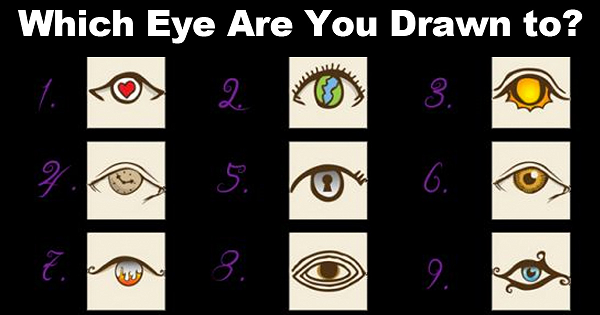 Scan the eyes below and without overthinking it, choose the one eye that you are drawn to above the others and then read about what this choice may reveal about your personality. Do you tend to be open, conscientious, tortured, philosophical, mysterious, sensitive, fiery, eccentric and/or intuitive? Please be aware that this is not hard science, but a conglomeration of interpretations. Just try it and see if the interpretation rings true to you. Have fun! If you are drawn to 1, Deep Down You Are Open. You’re the type of person who will welcome almost anyone into your life and heart. You believe that it’s better to take a risk and get hurt than to close yourself off to the world. You don’t show the world your fears or insecurities. You believe that your problems should be dealt with privately. You try to be totally there for everyone, even if you’re hurting inside. Helping others is how you heal.